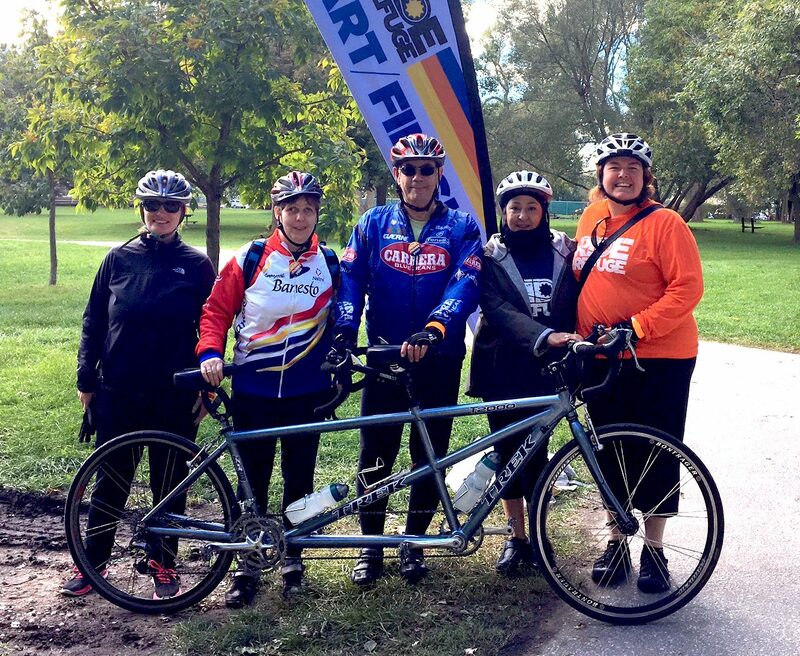 PWRDF Toronto team riders Jeanine Cudmore, Kim Umbach, Ron Gumbs, Jeannethe Lara and Sheilagh McGlynn. 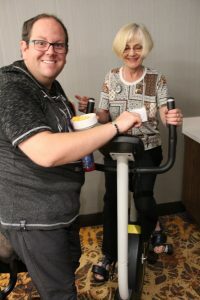 Diocesan reps Jonathan Patton (Quebec) and Mona Edwards (Western Nfld) ride the stationary bike at PWRDF’s National Gathering in Toronto. On Saturday, September 29, something wonderful happened. They came and they rode. Alone and in tandem. 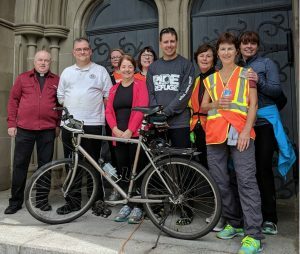 From coast to coast, volunteers rolled and walked along scenic roads and paths; Diocesan Representatives and Board members rode to nowhere on stationary bikes at the PWRDF National Gathering in Toronto. 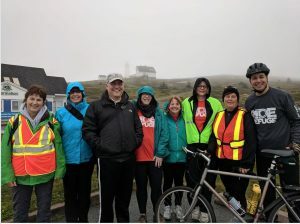 Riders and walkers in the Diocese of East Newfoundland and Labrador started out from Cape Spear and finished at the Cathedral in St. John’s, raising more than $3,700 for Ride for Refuge. Early on Saturday morning, before PWRDF’s annual general meeting, volunteers even walked the neighbourhood of the Hilton Doubletree Airport Hotel in Toronto. Though the scenery may have been different for this year’s Ride for Refuge participants, their goal was the same: to raise $25,000. We are proud to report this was exceeded by almost $2,000. As of October 12, the family, friends, colleagues and supporters of our nine Ride for Refuge teams across the country,morning, had raised $26,839, with money still coming in. Out of 193 charities across Canada who participated in the Ride, PWRDF ranked 14th. You can still donate until October 31 (scroll down on the Ride for Refuge page and choose a team to support). Proceeds from the 2018 Ride will feed thousands of hungry people living with drought, famine and displacement (through our membership in the Canadian Foodgrains Bank), and provide the means for women in Guatemala to start their own businesses and build their dreams of a better life for themselves and their families through our partners Madre Tierra and Ixmucane. Thanks to everyone who participated, supported, cajoled and encouraged for making the 2018 Ride for Refuge such a success. See you next year on October 5!